Next week my uncle is coming to do some renovation work on our living room and I can't wait to share the changes with you! It's definitely going to be a slow evolution as we get time and money to work on the room over the next several months, but I need some advice/opinions STAT. We need want to purchase a piece of art to hang prominently in the room as part of the update and I'm in need of advice. Something about buying ART, even if it is a reproduction, intimidates me. I feel like it's a momentous occasion and I'm rendered utterly incapable of pulling the trigger on my own. There is virtually NO color in our room currently. Gray walls (love them) dark brown coffee table (love it), brown sofas (hopefully getting the slipcover treatment soon)...you get the idea. I want to bring in a piece that I can draw colors out of for the rest of the room. And lately I've been hung up on reds, indigos and golden hues. I want something bold, but not something that I'm going to tire of looking at ALL the time. I'm thinking of buying from art.com...has anyone had a good experience buying from them or another online art reproduction company? If you're reading this I really need your opinion. So leave a comment okay! Thanks! I love the earth tones that go with a red, but an earthy red. 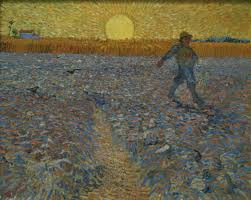 (I love the Van Gogh) I am also drawn to blue because of the tranquility it gives me. Look inside and see what you are drawn to and go with it. If it makes you happy, you will like it years from now, or you can always sell it...as your taste change. I shudder to think of my "decorating" style when I first married. 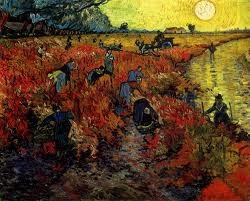 I love the colors of The Red Vineyard at Arles. I think it would be the easiest to draw colors out of. It also has the most visual interest and would definitely capture people's attention. My 2nd fav is Wheatfield with Cypresses. I think that would be the one I'd never tire of looking at because it's so peaceful. OOOh, I think you should buy a big canvas at the craft store and make something original on your own. You are so talented, and there are so many great ideas out here in blogland... you could even involve the kids (in a VERY directed way, of course, unless you want a paint disaster on your hands - but you could hand them the color you want on a brush and tell them where to put a little squiggle or dot and then for all time, your kids can point to that art and say "I did that!") You can always paint over it if you don't like your first attempt and try again. Something original and unique to your home would be so special. Oh, and let me know where you find good slipcovers! 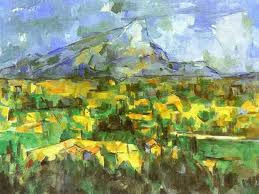 I like the Vineyards and the mount sainte vic ones the best. The waves are overdone in my opinion for Japanese art. I think the mountains would be a little more unique than the vineyards, bc there are some many reproductions in those colors- they are popular! Katie have you thought about getting a canvas some colors and letting E and Brit go at it? It would be an original and you can control the color pallet. Might make a good story too! !